Free Comic Book Day is a yearly event taking place at local comic shops where fans are able to get free comics and limited edition items. It takes place the first Saturday in May each year and in 2019 falls on Saturday, May 4, 2019! In years past WizKids has released items for the day from their Heroclix and Dice Masters lines of games, each having deep roots in comics. This year sees two releases. The PX Iron Man HeroClix: Free Comic Book Day Figure from Wizkids/NECA has an enhanced paint job and effects and will include an exclusive HeroClix figure and card in a polybag with hangtag. The PX Marvel Dice Masters Promo Starter Pack includes Marvel Dice Masters: Uncanny X-Men Dice-Building Game Starter Set and Marvel Dice Masters: Avengers – Age of Ultron Starter Set. Free Comic Book Day is a yearly event taking place the first Saturday of May and a fantastic celebration of comics (and general geekdom). Each year millions of free comics are given away and often other companies get in on the fun with comic related giveaways/promotions. Wizkids have been taking part for years now, and this year is participating with a promotion for their popular Dice Masters game which features comic characters and properties from DC Comics and Marvel (as well as Yu-Gi-Oh and Dungeons & Dragons). This year’s promotion features a Batman card which is attached to some starters (and stores will determine how they want to sell/give away those starters). The card, Batman: Terror of Crime Alley, features an image from the classic Batman TV Series (of which Heroclix, also by Wizkids, will be getting a convention promo also based on the tv series). There is also a blank variant, which is perfect to have your favorite comic artist sketch their take on the classic character. The card is a variant for the Batman: Terror of Crime Alley card featured in the DC Dice Masters: World’s Finest set which came out in mid March. You’ll possibly be able to get your copy May 7, 2016. WizKids Releases Marvel HeroClix: The Avengers Quick-Start Kit on Free Comic Book Day! Spring is here! The sun is shining, the birds are singing and for comic book fans this means Free Comic Book Day is here! This year, WizKids will be celebrating Free Comic Book Day (FCBD) with the release of the Marvel HeroClix: The Avengers 2015 Quick-Start Kit. 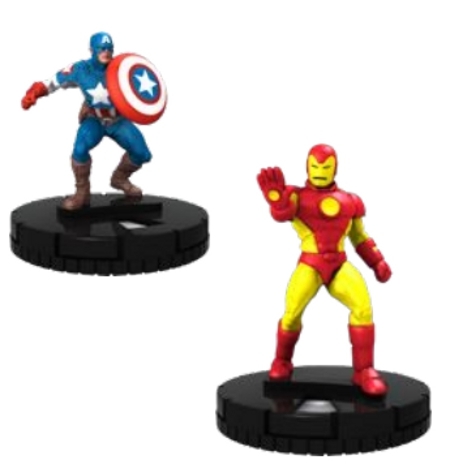 Visit your Friendly Local Game Store on Saturday, May 2nd to pick up the new Marvel HeroClix: The Avengers 2015 Quick-Start Kit featuring two fan-favorite Avengers— Captain America and Iron Man! The Marvel HeroClix: The Avengers 2015 Quick-Start Kit is specifically designed to help introduce new players to HeroClix— the Captain American and Iron Man are the perfect entry level game pieces with easy-to-learn HeroClix dial designs and power descriptions printed right on their character cards and each kit includes HeroClix Quick-Start rules sheet and 9” x 24” mini-map. Shops will have a limited quantity of the kit, with a suggested retail price of $4.99, to be used as a handy and affordable HeroClix starter for 2015 Free Comic Book Day events. Be sure to find a participating FCBD shop and give them a call to see if they’ll be carrying this awesome Quick-Start Kit! Wizkids is looking to repeat this year’s Free Comic Book Day offering with a new Heroclix starter set for individuals to get an easy introduction into the game. The Marvel HeroClix: The Avengers Quick-Start Kit will include two figures, Captain America and Iron Man, as well as character cards, quick-start rules, and a board game map. The set will retail for $4.99 and the two figures are meant as non-collectible figures, so not to be used in tournaments. The next Free Comic Book Day is on May 2, 2015. WizKids/NECA have announced the 2013 Free Comic Book Day figure—Marvel’s Iron Man. Coinciding with the much-anticipated Marvel’s Iron Man 3, in theaters May 3rd, the physical Iron Man FCBD promo figure will hit shelves of local hobby shops May 4, and will be available while supplies last. Each figure comes with a character card and free code to unlock its digital counterpart in HeroClix Online. Hillside, N.J.—April 24, 2012—Wizkids and National Entertainment Collectibles Association (N.E.C.A.) today revealed the 2012 Free Comic Book Day figure to be distributed at no cost to collectors, enthusiasts and fans at comic shops nationally on Free Comic Book Day, Saturday, May 5th. The physical figure, Thor, comes from the Marvel’s The Avengers HeroClix collection and will also contain a code for its digital counterpart. This year marks Wizkids’ fourth year participating in Free Comic Book Day, offering comic book shops around the country a free Super Hero figurine to distribute to shop-goers. Wizkids/NECA currently holds licenses with several mainstream comic IPs, most notably utilized in the world’s best collectible miniatures games, HeroClix and HeroClix Online by Wizkids. The free figure will be available on a first-come, first-served basis starting on Free Comic Book Day, May 5 at comic and hobby shops nationally. Single-figure boosters with “Free Comic Book Day” and “Avengers Marquee” packaging will contain the figure. Each figure will contain a free code for the figure’s digital counterpart, which can be redeemed and used in the online game, HeroClix Online. For a list of participating shops, visit www.freecomicbookday.com. As part of this Saturday’s Free Comic Book Day, Wizkids will be giving away another Heroclix figure. This year’s figure is Green Lantern! Green Lantern comes well-armed for any battle. Front loaded Running Shot and Perplex allows Green Lantern to take the offense in the early game while Energy Shield/Deflection protects him from long-range retaliation! Mid-dial, Green Lantern changes tactics and goes into close-combat with Blades/Claws/Fangs and Plasticity (to keep your opponents’ figures locked down), while Green Lantern trdes Energy Shield/Deflection for Toughness. Late-dial Green Lantern switches back to Energy Shield/Deflection and trades his Green Spear for a Green Knockout Punch (Incapacitate) which he can use in close or target two opposing figures from up to eight squares away. Best of all, Green Lantern’s Indomitable ability allows him to act without fear of pushing damage!